This week, Philip Morris International (PMI) launched a new “Year of the Unsmoke” campaign. With a big budget advertising campaign, PMI is using unsmoke to appeal to smokers, regulators and nonsmokers to “make a better future for all smokers in the world” and is offering less harmful choices to those who are still smoking. About 5 trillion cigarettes are sold in the world annually. PMI owns about 14 percent of the cigarette market which is about 700 billion sticks. PMI is the world’s largest transnational tobacco company and makes the bulk of its profits from cigarettes sales and is continuing to target developing countries to expand its cigarette business. When one unwraps PMI’s new unsmoke campaign, there is nothing unclear about its tactic. At the heart of it is a new initiative to undermine tobacco control. It wants to shift policy makers and advocates away from tobacco control, which denornalizes the industry, to refocus on so called new products, (which are not unharmful), and re-normalise the industry. Even more diabolical, this new campaign makes the tobacco company appear to be part of the solution. undo the benefits brought by the WHO Framework Convention on Tobacco Control. PMI puts the tobacco control community in a bad light, especially the World Health Organization, (WHO), and belittles their efforts claiming “many people and organizations still prefer to focus on an ideological fight” and “controversy they generate continues to confuse people who smoke”. Meanwhile evidence from the ASEAN region shows PMI’s tactics are already being rolled out. While PMI claims on one hand cigarettes are harmful, smokers should quit and children should not buy them, but in the Philippines it is refuting this evidence about cigarettes. PMI’s lawyer is representing the Philippines Tobacco Institute which has filed two court cases challenging Balanga a small city which has passed laws to ban smoking in public places and protect its youth from being exposed to cigarette promotions. PMI’s internal document from 2014 reveals it regarded e-cigarettes and other reduced risk products as its “good news” because, “We’ve got a great story to tell, there are divisions within the anti- tobacco movement, e-cigarette users are more willing to fight back than smokers.” The industry has been trying to prevent Malaysia and Philippines from banning e-cigarettes as Brunei, Cambodia, Thailand and Singapore have done. In Malaysia, IQOS are being sold without pictorial warnings because Health officials are uncertain as to whether heated tobacco products should have them. However according to the definition of the Control of Tobacco Products Regulation, heated tobacco products should be regulated as tobacco products and hence should carry pictorial health warnings. In Indonesia, a think tank, which lists a tobacco-related entity, Sampoerna Strategic, as one of its clients, and headed by the former CEO of Sampoerna Foundation, the charity arm of PT HM Sampoerna ( owned by PMI), authored a tobacco road map promoting the industry as being important to the economy and should be protected till 2045. This road map was used to defeat tax increase when a Minister of Finance Regulation on Tobacco Excise Tax to increase tax for 2018 and a roadmap for the simplification of tax tiers was suddenly revoked. In 2014, PMI referred to the WHO FCTC as a regulatory runaway train and drew up a strategy to influence it. 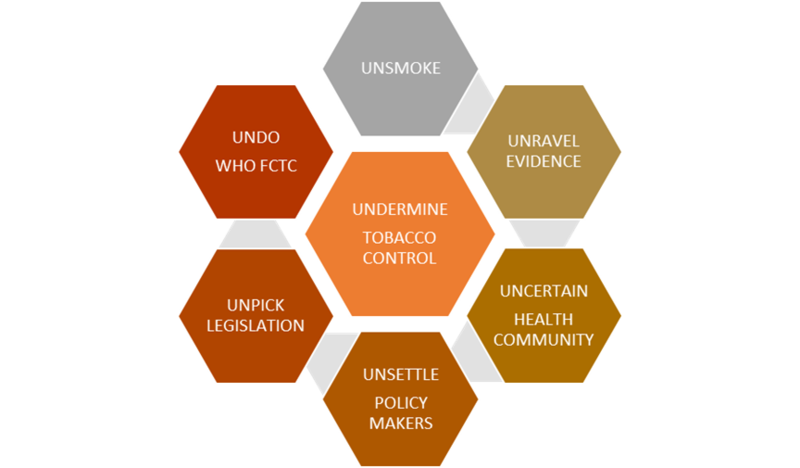 Unsmoke is an attempt to counter the WHO FCTC and an alternate to untobaccocontrol, the knowledge hubs facilitated by the FCTC Convention Secretariat. If PMI wants to unsmoke, it first has to recall its cigarettes from the market, admit liability, halt its lawsuits, pay compensation for deaths related to its cigarettes, and stop the manufacture and marketing of its cigarettes. That is standard practice for consumer products found to contain a health risk.